It's not just the folks at AMD who hope that that the company's Epyc server processor, officially launched Tuesday, will break Intel's stranglehold on the data-center chip market. Enterprise users, web hosting companies and hyperscale cloud providers all want competition and choice in server chips to curb costs and fuel innovation. "OEMs have been looking for an alternative to Intel for a long time, and with Intel having 98 percent market share I can say that there's absolutely a need, from the OEM point of view and the channel point of view," said Patrick Moorhead, principal at Moor Insights & Strategy. Judging from specs, performance benchmarks and memory features as well as the supporting voices from software and hardware makers in the data center ecosystem, Epyc has the best shot of any chip to hit the market in years at putting a crack in Intel's dominance. "For AMD to penetrate the market, win hearts and minds, to create value that customers are willing to pay for, we have to be disruptive," said Dan Bounds, senior director of data center products and enterprise solutions at AMD. "To come in and have a product that looks and smells like the competition really isn't useful." Though AMD has been teasing Epyc's features for some time, and leaks of spec sheets have been circulating this past week, Tuesday's launch is the first official public unveiling of details for the whole product stack. 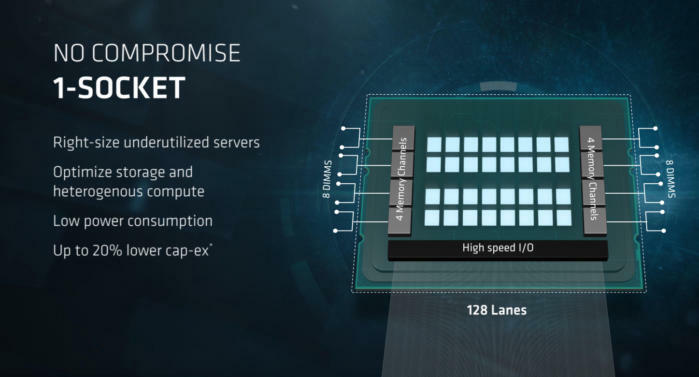 The bottom rung features the Epyc 7251, which offers eight cores supporting 16 simultaneous threads, and a base frequency of 2.1GHz that tops out at 2.9GHz at maximum boost. 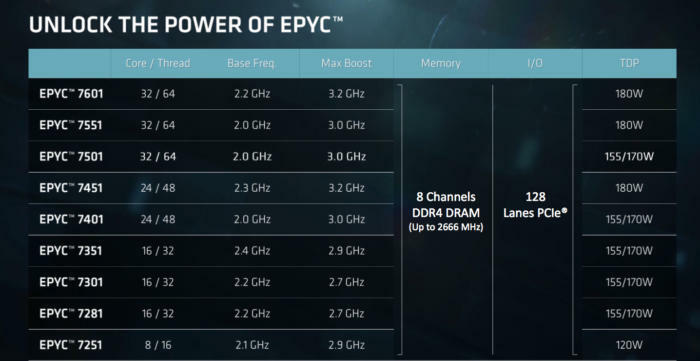 The top of the line Epyc 7601 has a whopping 32 cores, 64 threads and a base frequency of 2.2GHz, with maximum boost at 3.2GHz. Intel's Xeon chips, meanwhile, have up to 24 cores. AMD's Epyc processor family ranges from eight cores to 32 cores. As more and more data moves to the cloud, data center servers are put increasingly under stress. Adding cores to processors will help servers react quickly, for example, to search requests as well as recognize images and process video faster. But the Epyc story doesn't stop at the number of cores the processor offers. All the processors, up and down the product range, offer eight memory channels supporting up to 2666MHz DDR4 DRAM, 2TB of memory and 128 PCIe lanes. TDP (thermal design power), the maximum amount of heat expected to be generated by a chip, ranges from 120W at the low end of the range up to 180W for the monster 32-core model. To top it off, all of this is offered in a single-socket chip, which can be paired with another Epyc chip in a two-socket system. At the high end, in approximately the $4,000 range, AMD internal benchmarks show the Epyc 7601 single-socket package offering 75 percent higher floating point performance (for spreadsheets, graphics and games, for instance) and 47 percent higher integer processing performance (for whole-number and text processing, for example) than Intel's E5-2699A v4. Interestingly, AMD benchmarks show 70 percent higher integer performance over Intel in the mid-range, $800 price point level, with the Epyc 7301 facing off against the Intel E5-7630. At the Tuesday unveiling, AMD has a variety of partners doing demos to back all of this up. Pricing is important, but it's the entirety of the SoC (system on a chip) that gives AMD a foothold in the data center. "What makes it so attractive is that it's not just AMD selling something for less," said Moorhead. "It's that a single socket server with all of the bandwidth and cores that are available will allow people to make smaller servers so you can have a higher density, and density is key particularly with the hyperscalers or even people in hosting." Essentially, Epyc allows data centers to fit more servers into a smaller space, saving power, space, and operating costs. The greater the scale, the greater the savings. AMD's Epyc processor is available in one-socket and two-socket models. AMD says it's the balance of performance and scalable memory that is its big differentiator. "The floating point performance we believe gets us a seat at the table and allows us then to unpack our memory bandwidth story and our memory performance," said AMD's Bounds. Having the same memory capability and the same I/O footprint across the product range, from the 8-core version to the 32-core version, is key, Bounds said. "It's a massive, massive differentiator and disruptor over Broadwell and will continue to be so over Skylake," he said, referring to Intel's current and next-generation Xeon architecture, expected to be officially launched in July. While Skylake will offer a performance hike over Broadwell, the expected 15 percent boost will not be enough to make up the gap with Epyc, especially in the single-socket package, while the memory scalability will also help AMD's new chip to stay competive, Moorhead agreed. Epyc will be socket-compatible with the next generation of the product family, and it also has a dedicated security subsystem, where AMD is burning cryptographic functions into the silicon of the memory controllers, effectively encrypting memory, Moorhead noted. This is AMD's third big try in the server market; it has had enough success and failure to say it knows what it takes to be successful. When it came out with the Opteron Dual Core processor in 2005, offering a twofold single-socket performance advantage over Xeon, it grabbed 20 percent of the market within two years. But a few years later, bugs and postponements in the launch of its Barcelona chip architecture allowed Intel to recapture lost ground. Then, AMD moved away from X86 architecture and embraced ARM, but Intel made technical advancements such as increasing power efficiency, reducing advantages that ARM offered. Several makers of ARM-based chips have gone out of business and by the time AMD released ARM-based servers, there was little interest. At the March summit for the Facebook-founded Open Compute Project (OCP), Microsoft said it was working with Cavium and Qualcomm to embrace ARM as part of its Project Olympus next-generation modular system architecture for cloud computing, but that alone is likely not enough to bring about actual deployments of ARM server chips anytime soon. Meanwhile, also at the summit, AMD announced that it too was working with Microsoft to incorporate Epyc into Project Olympus. Unlike ARM chips, Epyc, which incorporates the X86-based "Zen" architecture of its recently launched Ryzen Threadripper processors for PCs, does not require software makers to rewrite code already tuned to x86. A big part of AMD's Epyc rollout involves highlighting support it's getting from the industry, including declarations from HPE, Lenovo, Dell-EMC, Asus and Gigabyte. On the software side, Microsoft, Red Hat, VMWare, Xen, Suse and Citrix have certified or are in the process of certifying applications and databases for Epyc. Ultimately, though, the proof that Epyc can make a dent in the market will come when the hardware makers come out with Epyc-based systems, and users deploy them. Some Epyc servers are expected out in the next few quarters, with ramp-up of production extending into 2018. Likely, cloud providers and hosters will be among the first users.